Reviewed by Dan Hastings on January 22nd, 2018, playing on PlayStation 4. 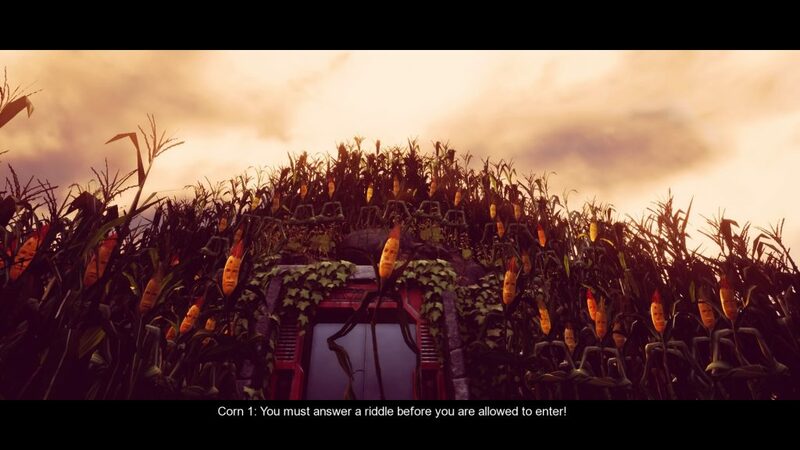 Maize is a point and click style puzzle game played from a first-person perspective. You start the game standing in a cornfield with no backstory other than knowing that there is sentient corn running around the fields. You are left with nothing other than your natural curiosity to go and find out what is going on. Depending on what you consider funny, the rest of your experience will either be terrible or brilliant. Off the bat, you can only assume that this game is going to be a comedy. Stalks of corn coming to life do not exactly forbode danger. The humor in this game is quite dry and idiotic. I personally enjoy this and as a result, I found this game to be a lot of fun to play. The stalks of corn are complete idiots! Most of the time you come across them it is face-palmingly stupid stuff that they are getting up to. For example, blocking off a large portion of the field (and blocking your way) for a tea party. It was all very random and funny. 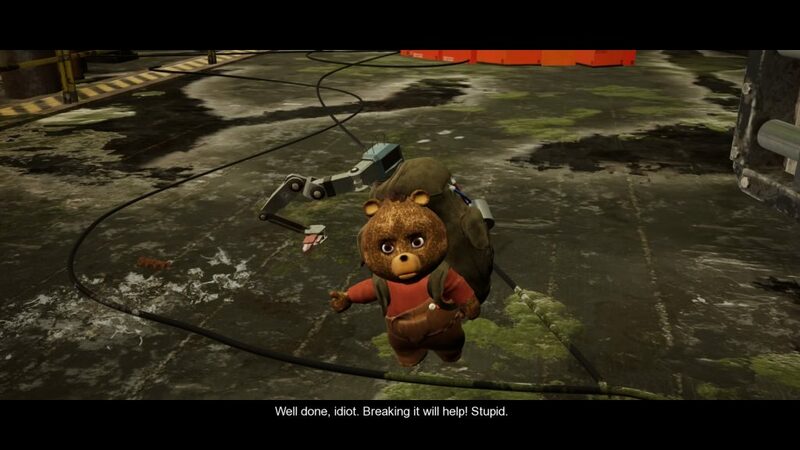 While the corn supplied lots of humor to the game, your companion, a mechanical Russian bear named Vladi did not. The game portrays him as this loveable bear who can't catch a break. Perhaps this is true if there was a backstory, but from the moment you meet him, he just complains. No jokes, no funny moments, he literally follows you around for the entire game and says "stop picking up garbage" every time you pick up an item. Says something about "idiots" when you come across something that's broken. He is just a broken record who adds no real humor to the game. It would be funny if you bumped into him now and then and he was having a hard time, but this guy follows you around for the entire game and literally complains ALL the time, using the same lines over and over. I learned to channel him out, but it was quite irritating when I finally solve a puzzle to hear "stop picking up garbage you idiot" in that stereotypical Russian accent. For what appears to be a relatively low budget game, the visuals are quite nice. There are quite a few ugly textures, but the overall look of the cornfields and various areas of the game you visit are nice. There were a few times where it seemed like there were textures that just didn't load. The corn characters looked quite good in some scenes and then in others, you could hardly make out the pieces of corn that made up their corn cob heads. It was like the texture just didn't load and remained blurry for the entire scene. This is a minor issue, but it popped up enough for me to wonder what was going on. Other than the texture pop in and the occasional screen tearing, the visual quality was good for a smaller game like this. Since this is a puzzle game, the main focus of the gameplay is solving them. At times the game felt like the Zero Escape games where you would find random items around the place and these may or may not be used or combined to get through some puzzles in the area. It was definitely an interesting way to approach a game like this and I was one of the main reasons I liked it so much. I never really found myself to be stumped by anything. The corn people often block your way using orange boxes. It doesn't make a lot of sense at times, but this is how the game sort of guides you to where you need to go. It stops you from wasting hours wondering around locations that you shouldn't be in yet. The puzzles were fairly small compared to other games I have played like Obduction. Generally, if you find an item, you will find the use of it nearby. To solve most puzzles you generally just apply item from your inventory to the object you are trying to interact with. The lack of any large scale puzzles made the game a lot easier than similar games in this genre. Although the puzzles were moderately difficult at best, they were fun to solve. For main focus of the story is around the corn. You come across them now and then and they are usually getting up to stupid things. They have a real fondness for taking naps which is usually the motive for them leaving the scene. The narrative is a mix of finding out the backstory, by means of sticky notes placed all over the place and the progression of current events where you need to help the corn escape the farm. 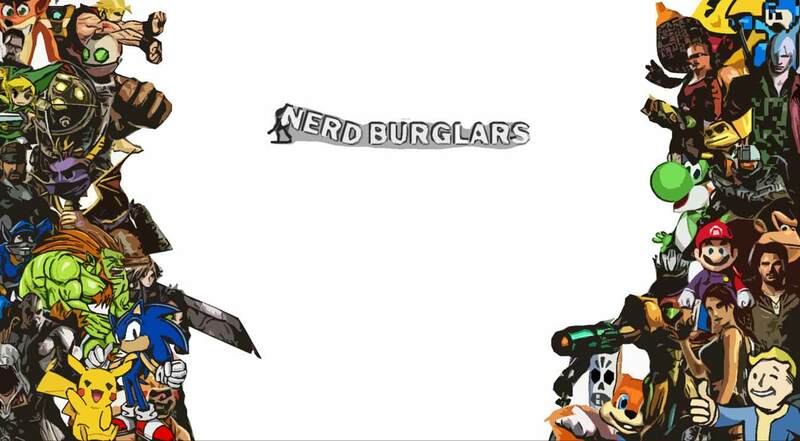 Escaping is made difficult as there is a very "Ratchet & Clank style villain" who is attempting to get in the way. Although the story isn't mind-blowing, it is very unique. This uniqueness, combined with some good background music, gives the game such an unusual charm that makes it all the more enjoyable to play. 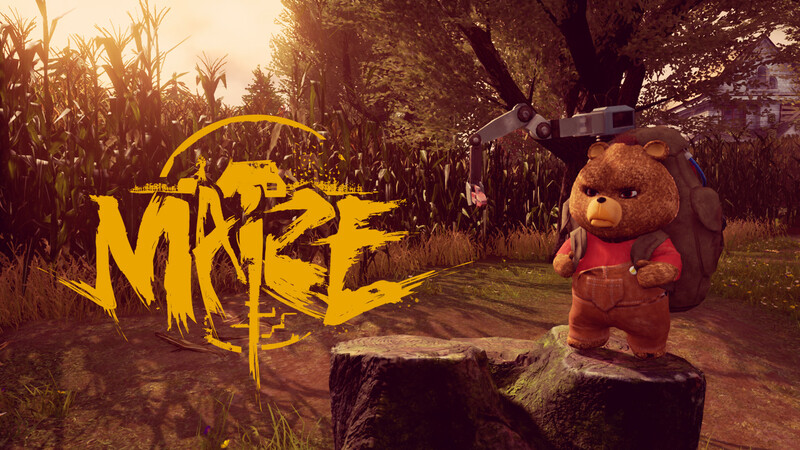 Maize is a fairly short game. It took me about three and a half hours to complete without needing a guide. There is an achievement/trophy for completing it in under 2 hours, which could be very easily done on a second playthrough. Since it is a cheap game, the length isn't something I can critique it for. If anything it is a sign that the game is good as I wanted more once I had finished it. The entire game is based around the farm and a farm can only be so big, so you wont find yourself visiting myriad of fantastic locations. There was definitely room to make this game a bit longer, but I don't think there is much of an opportunity to make a sequel. Maize is likely a one time thing, which makes me value it all the more. Your companion repeats himself a lot and it gets very annoying. 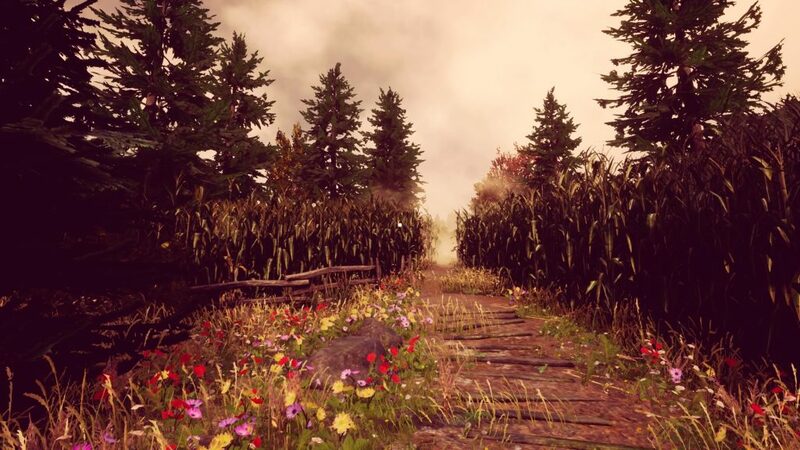 Maize is not without its flaws, but it more than makes up for them with a unique and humorous story. By no means is it the best puzzle game I have ever played, but it is still a good one. This game stands out from other similar games by being funny and so distinctly strange. For the price, it is a game that is well worth picking up if you fancy a quick puzzle game and a few laughs.